Aligning partners around a shared result: Higher Expectations and its partners have aligned their work around a fully capable and employed Racine County workforce in policy and practice. United Way of Racine County (UWRC) aligns all funding decisions to this vision, and Racine Unified School District (RUSD) launched its “North Star,” a vision of “all students graduating prepared for college and/or career.” Recognition from Ford Next Generation Learning highlights RUSD in collaboration with Higher Expectations efforts to develop a collaborative structure that supports community engagement in schools. Higher Expectations also has engaged more than 91 employers in the Academies of Racine, which provides students with opportunities to gain skills needed for a 21st century workforce. 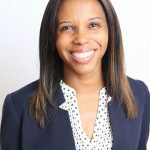 “I’ve now lived in four different communities, but have never seen a community as well aligned on a single focus, a real purpose of preparing [young people] for careers. [Higher Expectations’] work resonated strongly with me,” said Chad Severson, InSinkErator CEO and a Higher Expectations leadership table member. 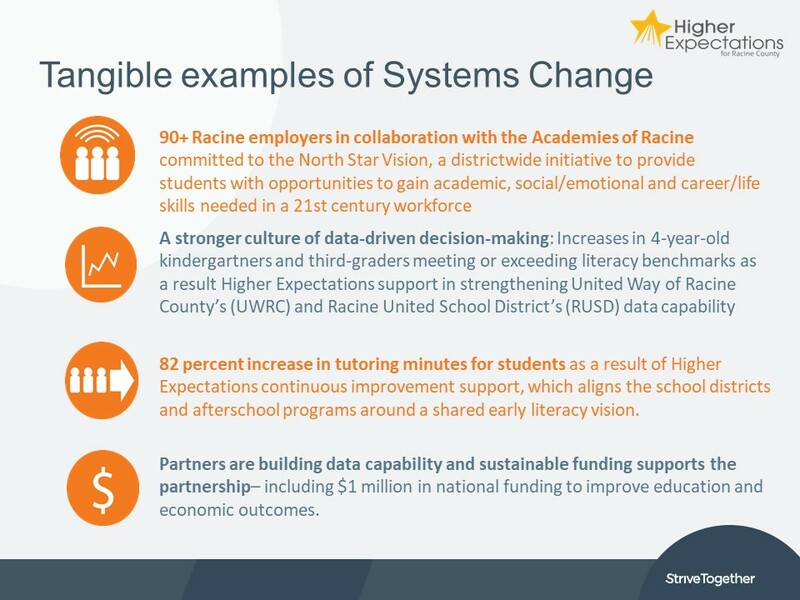 Building a culture of data-driven decision-making: Employing tools from the StriveTogether Leadership Program and the Tableau Fellowship, Higher Expectations has strengthened the capability of United Way of Racine County (UWRC) and Racine Unified School District (RUSD) to refine and disaggregate student-level data, set literacy achievement goals and assess and monitor programmatic impact through continuous improvement. RUSD has seen a 5 percent increase in 4-year-old kindergartners meeting or exceeding spring literacy development and a 2.7 percent increase in the number of third-graders achieving or exceeding the spring national literacy benchmark for the Measure of Academic Progress (MAP) assessment. District administrators described the power of using data for improvement after seeing 80 percent of classrooms with teachers participating in district training achieving higher reading growth than the median high-poverty, first-grade classes districtwide. Higher Expectations Data Manager Matt Snyder supported United Way of Racine County (UWRC) in tracking weekly “minutes data” for the Schools of Hope Tutoring program. As a result, UWRC each week identified and supported students who were at risk of not meeting the 1,800-minute goal (a goal set by analyzing best practice research from other tutoring programs). In the 2016-2017 academic year, there was an 82 percent increase in the number of tutoring minutes students received because of weekly data analysis and strategy changes in real time. Higher Expectations and RUSD used national research and local data to make the case for expanding access to full-day, 4-year-old kindergarten (4K) in Racine. RUSD increased the number of full-day 4K classes from 0 to 10 in three years. The district prioritized expansion to Title I schools, recognizing the need to support low-income students. This represents a $1 million commitment to expanding high-quality early learning programs. Building and investing in capability and staff to get results: Partners consistently build capability and staff are supported with sustainable funding to implement the evolving partnership strategy. 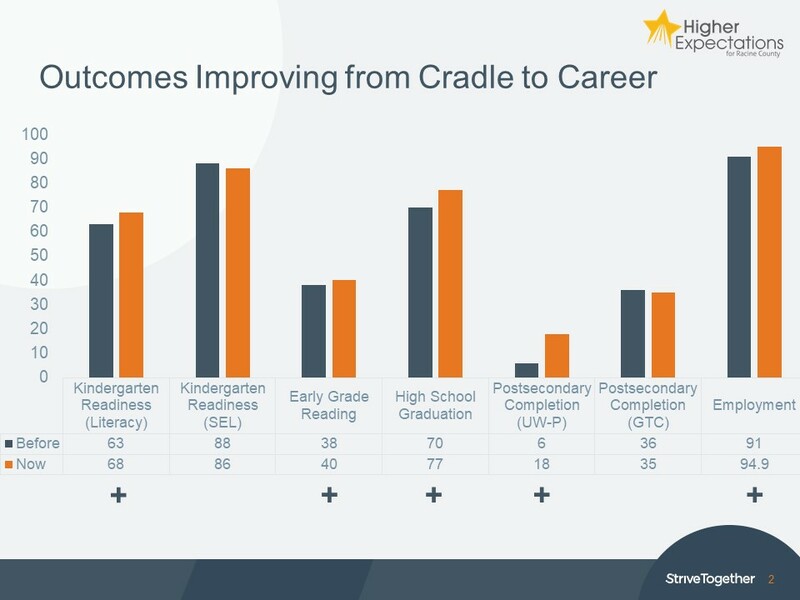 Higher Expectations has played a significant role in building the capability of partners across Racine County, including hiring and coaching new data support; Results Count™ leadership development for cross-sector teams working on five outcomes; and advocacy and policy. After having the opportunity to have her own capabilities built, Racine County’s Human Services Director Hope Otto identified opportunities to spread Results Count skills and competencies across the agency to better address the skill shortage among Racine county residents. “The A3, B/ART (boundaries of authority, role, task) and other results-based leadership tools has paid dividends. The A3 tool helped narrow the focus, so we could see what to work on. Now we are seeing triple the number of GEDs (general equivalency diplomas),” Otto said. Higher Expectations has multiple years of sustainable funding, including multi-year funding commitments from local employers and public institutions with $1 million in national funding to support improving education and workforce outcomes for Racine County.